Fun and adorable, cake pops are easy to make and delicious. Choose home made or store bought cake and frosting. Crumb cake into a large bowl. I used 3/4 of an 8×8 pan of chocolate cake. Measure out frosting and add it to the crumbs. Mix the crumbs and frosting well until the frosting has been completely incorporated in to the crumbs. It will still look like crumbs, but will hold together when pressed together. Roll the mix into 1″ balls, pressing firmly. To make the football shape, firmly press cake into an oblong shape, approximately 1 1/4″ long. It is important to compact the cake mixture so it doesn’t fall apart during coating. Place pops on a parchment paper covered baking tray and place in the freezer until firm, about 30 minutes. Place 1/4 cup of chocolate or white chocolate chips in a microwave bowl. Microwave on high for 30 seconds at a time, stirring well in between until completely melted. Add 1/4 tsp. of oil to chocolate and stir well. This will help the chocolate to coat smoothly. Remove one cake pop from the freezer at a time. Dip a lollipop stick in the chocolate and insert into the bottom of the pop to the center, being careful not to push out the top. Spoon chocolate over the pop, turning pop slowly over the bowl. Gently shake the pop to allow excess to go back into the bowl. For white chocolate on chocolate cake, coat twice. Coat once, allow to set, then coat a second time. he chocolate will set up quickly. If sprinkles or sanding sugar is desired, gently dip pop into decorations before the chocolate sets. To drizzle with another chocolate, allow coating to dry first and then drizzle. To make laces on the football pops, place melted white chocolate into a decorating bag or plastic sandwich bag with a corner cut and “draw” laces on top of pop. Set pop into Styrofoam, firmly pressing on stick, not pop. Allow to dry completely. Continue with the rest of the cake pops, removing one at a time from freezer, melting chocolate and adding oil as needed. To display the cake pops, cut a piece of Styrofoam slightly larger than your serving piece and press the Styrofoam into place tightly. Firmly press pop sticks into the Styrofoam. Once all the pops are in place, cover any Styrofoam showing with tissue paper. These can be made a couple of days beforehand and kept refrigerated until needed. 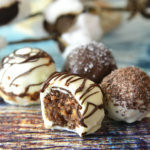 This Cake Pops recipe is gluten free and vegetarian.